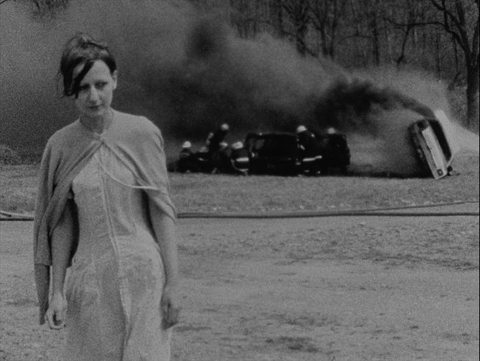 “One of the most impressive works to emerge from New York’s post-punk downtown scene” (Film Society of Lincoln Center), Sara Driver’s “lost” debut film, co-written and shot by Jim Jarmusch, is based on a 1948 short story of the same name by Paul Bowles (published in his Collected Stories 1939-1976). It is a haunting tale caught in the moment between waking and dreaming, told by Ethel, who escapes from an asylum in the aftermath of a train wreck. Ethel proclaims to an emergency responder that her sister is one of the dead; as she is transported to her sister’s home, time fractures and the narrative “I” disassociates. Did the train wreck precipitate Ethel’s commitment to the asylum or her escape? Did Ethel’s sister die in the wreck, or is it a symbolic killing of the sister who committed her? Jarmusch and camera assistant Tom DiCillo soon after collaborated on Stranger Than Paradise, another black-and-white NY indie touchstone. Driver’s film was touted by Cahiers du cinéma as one of the best films of the decade, but its negative was destroyed in a fire shortly its release and film was unseen for 30 years. In 2008, a print was discovered in Tangiers amongst Bowles’s belongings, and the film was restored. B&W, 16mm transferred to HD. 50 mins. Vancouver filmmaker Ileana Pietrobruno’s Cat Swallows Parakeet follows the progress of Scheherazade and Kore, two hospitalized young women who take up storytelling as a means of survival. Inspired by headlines in tabloid magazines, the young women enact an endless narrative, reminiscent of One Thousand and One Nights (aka Arabian Nights), to fend off death: for Scheherazade, at the hands of the doctor’s knife, and for Kore, the self-annihilation of an eating disorder. Pietrobruno depended heavily on the art direction of Bo Myers and Athena Wong to bring this visually-stunning film — about life in death and death in life— to life in the abandoned Riverview Hospital in Coquitlam. The film, says Pietrobruno, is “about celebrating entropy, decay and death, and gaining strength through problems and ugliness.” “One of the most drop-dead gorgeous movies ever made in Vancouver ... A dizzyingly ambitious experimental drama ... The apocalyptic production design is breathtaking ... Pietrobruno is a talented filmmaker of decidedly distinctive vision” (Jim Sinclair, The Cinematheque). Colour and B&W, 16mm. 75 mins.